Well, well, well, look what we have here... it's another baking post! It's safe to say, I'm really getting into the swing of the festive baking this year as I've had a list about as long as my arm of recipes I've wanted to try out since the last Christmas. For my birthday a little while ago now, Alex picked me up some cookie cutters as part of my gift, including all sorts of cute Christmassy shapes such as angels, stars, snowmen and Christmas trees. 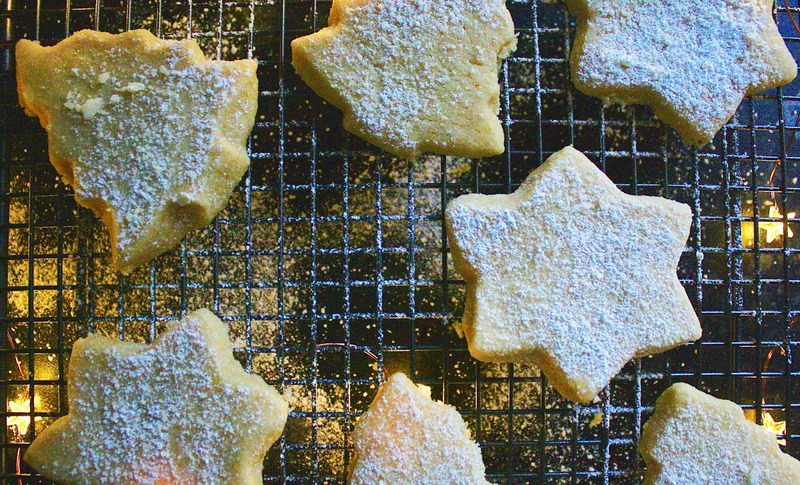 I decided what better way to put them to use than to bake some Christmas shortbread. 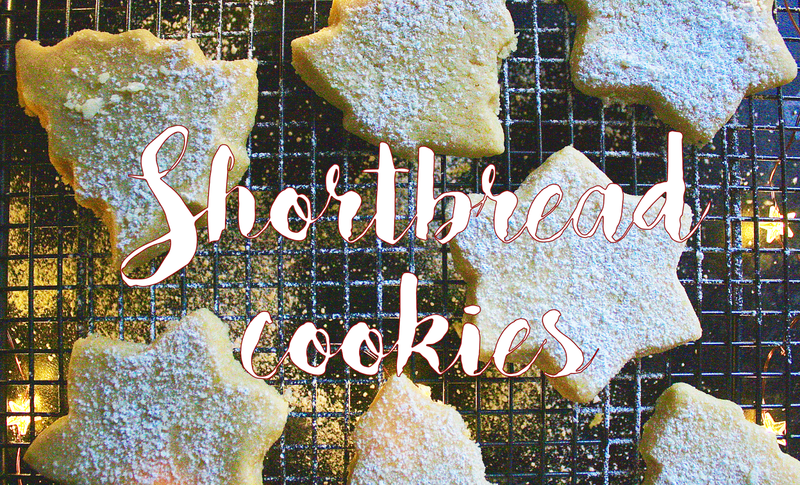 To bake my shortbread cookies, I decided to follow Tanya Burr's recipe that she posted last Christmas. 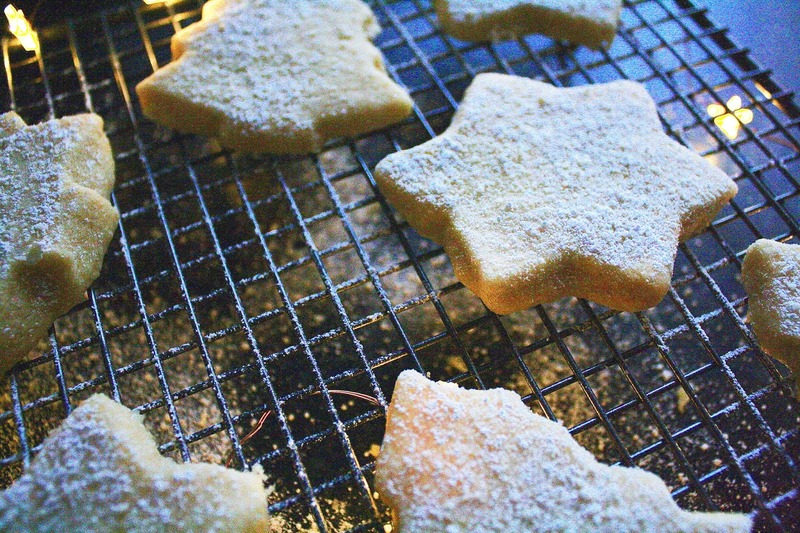 In Tanya's post, she made Christmas shortbread stars, but I wanted to throw Christmas tree-shaped cookies into the mix too so I've used both of my cutters for this bake. The recipe itself is so straight forward and I loved the fact that it only needed 4 ingredients. Step one: Preheat your oven to 130°c and line a baking tray with some baking paper. Step two: Rub your flour and softened butter together in a large mixing bowl until the consistency becomes crumb-like. Stir in your caster sugar and a few drops of vanilla extract and work the mixture until it pulls into a dough. Step three: Wrap the dough in cling film and set this aside in your fridge for around an hour. Step four: Lightly flour a work surface, take out your dough and using a rolling pin, roll out the dough gently to around a 1cm thickness (or however chunky you would like your cookies!). 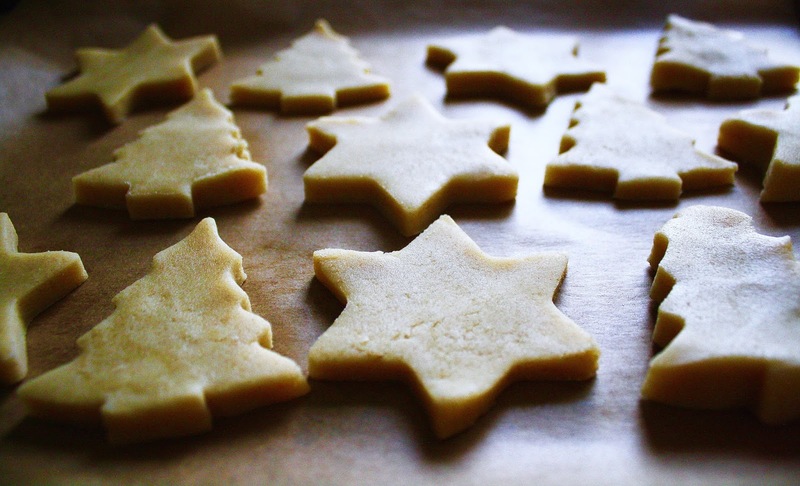 Step five: Using your chosen cookie cutter(s), gently cut out individual shapes from the dough and carefully place these onto your lined baking tray. As you can see, my Christmas tree shapes were a little round at the corners which meant the shape became slightly lost once baked (oops!). Try to keep the shapes as clean cut as possible to ensure they hold their shape once out of the oven. I managed to get around 12 small cookies out of my dough, and 1 as a tester. Step six: Bake your cookies in the oven for around 20 minutes until they start to turn a golden brown colour. If they are still a little pale, keep checking them and add a further 3-5 minutes to the baking time, subject to your oven's temperature. Step seven: Once your cookies are baked, carefully place them onto a cooling rack and allow them to fully cool down to avoid any crumbling. Once they have cooled, it's time to add your snowy topping (which works perfectly with the Christmas tree shapes especially! ); sift your icing sugar to add a light 'snowy' coating. Now all that's left is to plate us, settle down with your favourite Christmassy film and enjoy! these are looking so cute and yummy !